Useful tips to support our industry in creating compliant packaging, followed by expert discussion and networking. Update! See the video from the event here: FutureCannabisProject.org. Cheers! July 1, 2018 is the deadline for 2018 compliant product packaging in California. Products that are not compliant will be removed from the marketplace. The current packaging requirements under California state law can lead to some difficult choices about what to display on your product label and where it should be visible. Some of the requirements directly contribute to industrial waste. We are both examining business solutions and empowering businesses to affect policy through a discussion on what steps are needed to take effective action. This event series is focused on building our community, so that we can form a stronger network. This is a monthly idea exchange and networking event in Santa Monica. Christina Dempsey – Education, Training & Outreach Manager for the Manufactured Cannabis Safety Branch, the division of CDPH that regulates cannabis packaging. Juli Crockett – Former Director of Compliance with W Vapes and current Director of Compliance with MMLG consultancy. 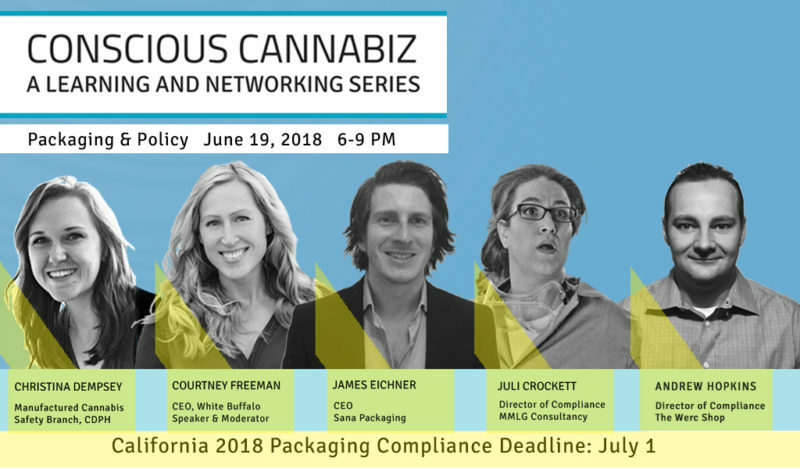 Courtney Aura Freeman – CEO of White Buffalo will be presenting helpful tips and compliance guidelines for cannabis packaging in California. While serving as Director of Product and Compliance for a global medicinal cannabis company, Courtney worked with a licensed manufacturer to bring one the first 2018 compliant, lab-tested product lines to market. Following this presentation she will moderate the panel discussion. Andrew Hopkins – Licensed customs brokers, Director of Compliance & Logistics, who leads packaging oversight for The Wercshop, a licensed cannabis manufacturer. James Eichner – CEO of Sana Packaging will discuss hemp-based plastic, an alternative to petroleum-based plastics. Industry partners are invited to exhibit. If you or someone you know would benefit from exposure on this topic, please get in touch using the form below.